Lisa ran across a couple good sounding (if not good looking) recipes for savory bread pudding recently, so we decided to take a crack at it ourselves. We used artichoke hearts, mushrooms, onions, and plenty of herbs and spices. A successful experiment that we’re definitely going to make again. The recipe below is how we made it, but there are endless combinations to try. I can’t wait to try this… MMMMM! So gooood! Do you think we got the consistency right? Yep! I’d expect a dessert bread pudding to be a little goopier but this is perfect. Yeah, I love this. It’s like a really good stuffing. 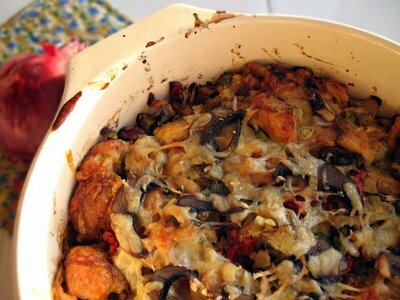 Preheat the oven to 400 degrees, and grease a large casserole dish. Place the stale/dried bread pieces in a large bowl. In a separate bowl, whisk together the wet ingredients and the vegetables, then add in the spices, adjusting the taste to your liking. Pour the milk mixture over the bread and let stand for 15-20 minutes to allow the bread to soak in much of the liquid. Transfer the bread mixture to the casserole dish and sprinkle shredded gruyere over the top. Bake for 45-55 minutes, until the top is brown and crisp and there is no liquid left in the center. Let stand for 10 minutes before serving. 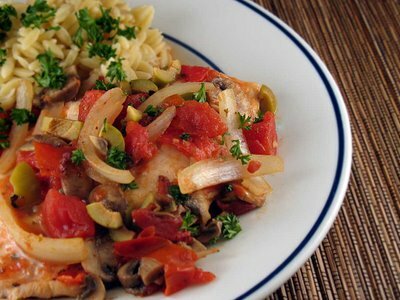 This recipe comes from Fitness Food. A hearty – but healthy! 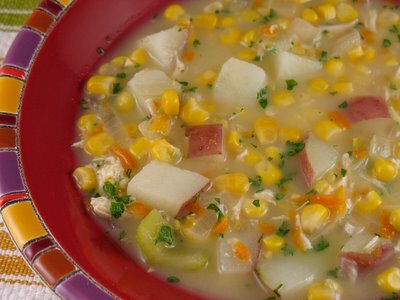 – chowder made with chicken, corn, and veggies. What’s with all the poaching this week? And isn’t poaching illegal? Different kind of poaching. 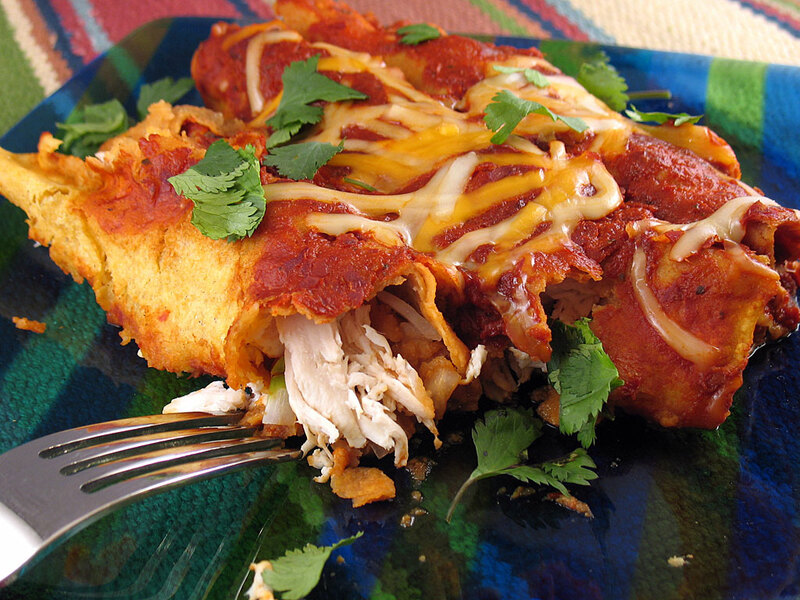 But I know what you mean — the enchiladas, the tuna, now this. Not sure. Maybe it’s like when all of a sudden there’s 20 zombie movies coming out, or books being written about Ben Franklin or something. Wait a minute — why is this “Ecuadorian” Chicken Corn Chowder? Well, it’s not really, but that’s where these bowls that Thad and Abbie got for us are from. Sneaky! Well, it’s still really good, in spite of your false advertising. …and the portions are huge! Cut 2-3 slits across the thickest part of the chicken fillet. Heat the stock in a large saucepan over medium heat, and poach the chicken fillet for 10 minutes or until just cooked through. Remove the chicken and set aside. When cool, use two forks to shred. Add the onion, potatoes, celery, and carrot to the stock. Bring to a boil, then lower the heat and simmer for 20 minutes or until the potatoes are done. Stir in the creamed corn, corn, milk, chicken, and parsley, and stir until heated through. To accompany our crab cakes tonight, I made this roasted mushroom salad featuring roasted shallots, green beans, and a tarragon dressing made from olive oil, lemon juice, and the liquid given off by the mushrooms themselves — mushroom lovers, this is for you! The only modification from the original recipe, found in Fitness Food, was that it called for tarragon vinegar; I substituted champagne vinegar because that’s what we had on hand. We’ll definitely make this again, next time I may keep the mushrooms warm and add them last. This salad *rules! * I heart shrooms. I love the dressing on this, and the roasted shallots are really good. Can you believe there are people out there who don’t like mushrooms? Weren’t you one of them just a few years ago? Preheat the oven to 400F. Place the mushrooms in a large roasting pan. Add the oil, garlic, lemon juice, and shallots and toss until coated. Roast for 30 minutes, occasionally spooning over the juices. Remove from the oven and cool to room temperature. Slip the shallots from their skins and discard the skin. Pour the cooking juices into a large mixing bowl. Add the champagne vinegar, tarragon, and parsley. Mix and season well. Blanch the beans in boiling salted water for 2 minutes or until just tender. Drain and while still hot, add to the dressing. Allow to cool to room temperature. 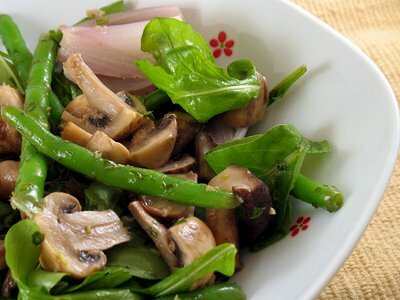 Cut the mushrooms into quarters and add to the beans with the shallots and arugula. Toss and serve.